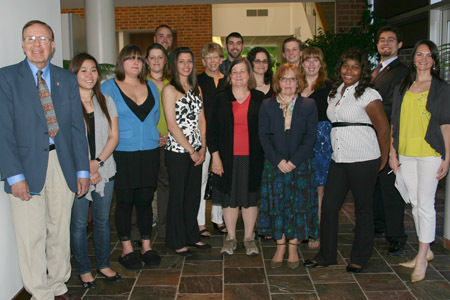 West Windsor, N.J.-- Like a proud papa, MCCC Professor Stephen Richman oversaw the proceedings as 19 high-achieving students were inducted into Alpha Mu Gamma, the national collegiate foreign language honor society, in a special ceremony on April 30. This marks the largest group ever for Mercer's Kappa Iota Chapter, which celebrates its 26th anniversary this year. Professor Richman is the group's advisor. As part of the ceremony for family and friends, a diverse group of students delivered short speeches in the languages they are studying at Mercer. In addition to speeches in Spanish, French, Italian, German, Arabic, and Latin, the presentation in American Sign Language (ASL) by student Sara Ziegelbaum marked a first. (ASL has recently been designated as a foreign language by the state of New Jersey.) Mercer also offers courses in Chinese, Hungarian, Japanese and Polish. Other honorees included Nancy Baskin, Brendan Belluscio, Michele Bouchard, Antonia Brooks, Kurt Daley, Alessandra Destasio, Stephanie Flim, Lindsay Floyd, Kar Mun Fung, Evelyn Grossman, Christina Heath, Brooke Kohlhofer, Elizabeth Reimer, Kiley Remer, Adrienne Sherwin, Kelly Smith, Sidra Umar and Karl Wheeler. Requirements for induction into Alpha Mu Gamma include a grade of at least an "A-" in any two courses of the same language and an overall GPA of at least a 3.2. 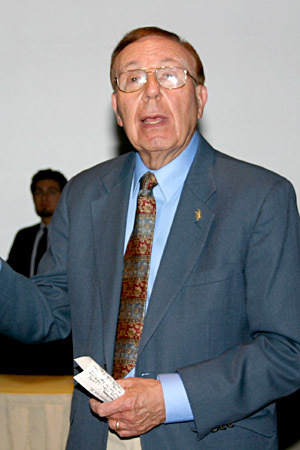 Chapter President David Hoyt encouraged students to never give up their study of languages, noting the increasing importance of communicating in a foreign language in today's world. "In cultures outside our own, people often speak two or three languages," he said. "There will be rewards for those who understand world languages." Professor Richman added that the study of language is a high priority at Mercer. "Eleven languages are taught here. I believe that it the most of any community college in the state," Richman said. The newest language courses to be added are Arabic, Chinese and Japanese. Spanish continues to be the most popular, followed by French, Italian and German. At the conclusion of the program, students were asked to add their signatures to the hundreds of names in MCCC's official Kappa Iota Chapter book, which includes every inductee since the chapter was established. "It's our 'Language Hall of Fame,'" Richman said. and chapter officers, President David Hoyt and Vice President Aiste Velyvyte, far right. 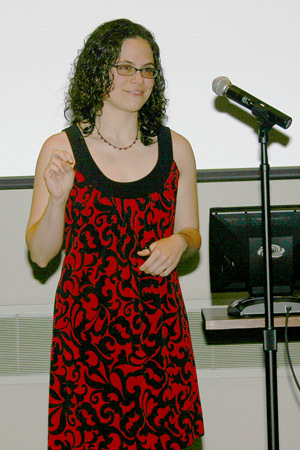 Sara Ziegelbaum presents her speech in American Sign Language (ASL). 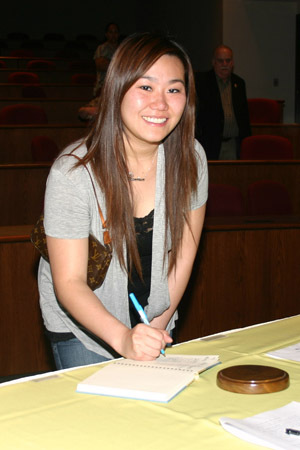 She is the first student to be inducted for the study of sign lanaguage. signs the official chapter book. 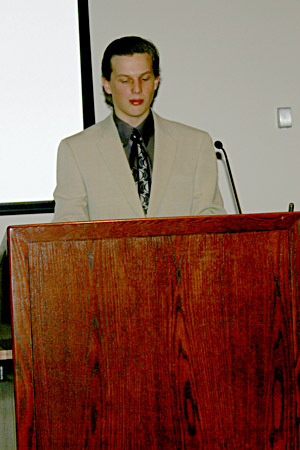 Karl Wheeler presents his speech in Latin. Copyright © 2005, Mercer County Community College. All rights reserved.